As an infant, Anna witnesses the brutal murder of her mother by her father, who is none other than Jack the Ripper. Years later, she is working for Mrs Golding, a fake medium, for whom she provides spirit voices during her ‘seances’. One of these sessions is attended by psychiatrist Dr John Pritchard and the outwardly respectable Member of Parliament Dysart, who has paid Mrs Golding for ‘other services’ to be provided that night by Anna. Pritchard later sees Dysart fleeing the house and, investigating, finds Mrs Golding impaled to a bedroom door and Anna in a state of shock. Convinced that Anna is mentally disturbed, he makes the mistake of taking her into his own home so that he can study her….. Between Hammer’s “The Lost Continent” (1968) and this film, Eric Porter played probably his most famous role as Soames Forsyte in BBC TV’s classic serialisation of John Galsworthy’s “The Forsyte Saga”. In the mid-eighties, he took the part of Professor Moriarty, arch-enemy of Jeremy Brett’s Sherlock Holmes, in Granada TV’s much acclaimed adaptations of Conan Doyle’s detective stories. 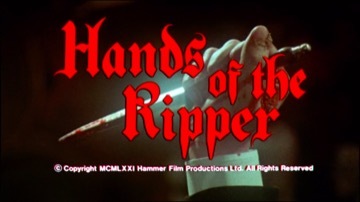 This was the last film to be produced for Hammer by Aida Young. She moved on to Associated London Films, where she produced “Steptoe and Son” (1972) and “Steptoe and Son Ride Again” (1973).